Access control are a security technique that can be used to regulate who or what can use resources in a building or business. There are two main types of access control: physical and logical. Physical access control limits access to campuses, buildings, rooms and physical IT assets. Logical access limits connections to computer networks, system files and data..
Access control management presents many opportunities for security solution providers. When your businesses grow and more employees are added, efficient access control management becomes essential to protect your business. What is the purpose of an access control system? All modern organizations need to protect their physical and IP assets along with ensuring the safety of their employees by controlling movement of people with pre-defined rules. 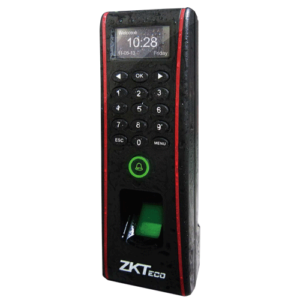 Access Control solution can control access on three dimensions simultaneously – user, zone and time. Answering the three fundamental questions – who, where and when. In addition, access control incorporates a range of value-added features like Anti-Pass Back, 2-Person Rule, First-in User, Blocked Users, Door Auto Re-lock, Guard Tour, Man-Trap and Smart Card based Identification ensure foolproof security of physical assets and safety of manpower. For small and medium business organizations, a standalone Access Control solution while keeping security and simplicity in mind. Access control software works on industry standard IP protocol allowing organizations to expand easily, even with a single door. These single door biometric and card controllers are connected to an intelligent standalone site controller on CAT5/CAT6 cabling. Organizations can control user and device configuration by use of the UI. Access control can be controlled and done without installing UI site controller on any devices.